Our maintenance philosophy includes Proactive Maintenance (root cause analysis) and Precision Maintenance (working to a standard). We follow the MAAD Training method (see below to find out what MAAD is) in our one-day, two-day & three-day programs. The standard we use is ANSI/ASA S2.75-2017/Part 1 American National Standard Shaft Alignment Methodology, Part 1: General Principles, Methods, Practices, and Tolerances. The MAAD Training programs are usually done at our own facility which is dedicated specifically for alignment and measurement training. 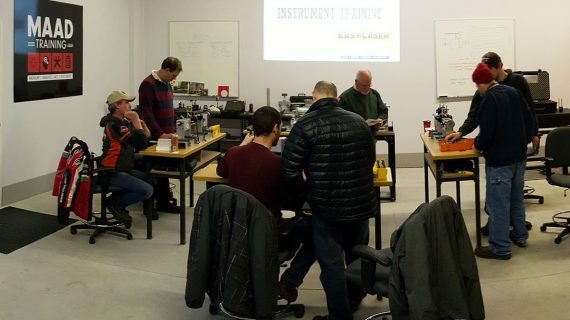 Our Shaft Alignment – Basic Operational course runs for about a half day in length and features your laser alignment system – we have many to choose from! While one of Easy-Laser’s guiding principles is simplicity of use, with straightforward on-screen prompts that guide and navigate you through the shaft alignment process, there are nuances to any system. So if you have just purchased a laser system, make sure you know and understand its full capabilities. Or perhaps you already own a system and need a refresher on the equipment? We run through the operation of the system, go through the “buttonology” and what features to use at what times. By far our most popular program. The first part of the program we cover the detection and removal of what we call the roadblocks to achieving correct installation or re-installation of a machine. This is mainly the removal of machine stress. The second part we focus on the the biggest roadblock of all – misalignment. In this section, we focus on your laser shaft alignment system going through each measurement program, where to use them and why. We also run through important and realistic situations that prevent proper shaft alignment like navigating around bolt bound and base bound issues. For more information on what’s covered, download our one-day brochure here. The two-day shaft alignment program is mainly done at our training facility. We basically delve deeper into the whole installation process. On the first day we spend time on the principles behind the laser alignment technology by using dial indicator kits to do shaft alignment. We use mathematical calculation as well as graphical solutions for alignment. 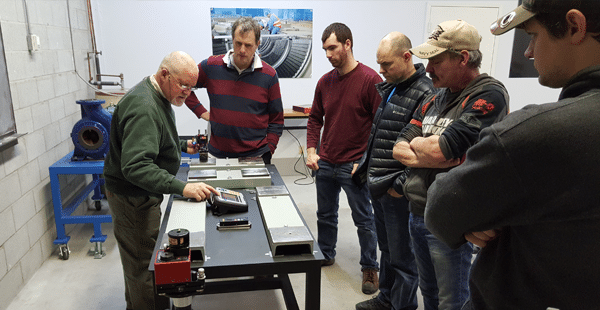 On the second day, we get into the laser alignment systems including how you work through many different alignment applications using your laser alignment tool. For more information on what’s covered download our two-day brochure here. Geometric measurement is the measurement of straightness, flatness, squareness, parallelism and plumb etc. We have basic laser systems that measure these applications. We also have systems for specific geometric measurement applications including machine bases, foundations and/or wind tower flanges (flatness), bore alignment, turbine measurement, rail measurement, sawmill alignment (straightness), roll and/or conveyor measurement (parallel), machine tool measurement (straightness, flatness, square) and more. We have specific rigs and alignment simulators for all this measurement, check out our training centre here! We customize each program’s content and length to meet your needs. M.A.A.D. is an acronym that we created which stands for Measure, Analyze, Act & Document. The MAAD concept can be used by anyone in the maintenance and reliability industry when trying to improve your maintenance processes. It is also a method that we promote and believe should be followed whether you’re a millwright, mechanic, maintenance manager, supervisor or reliability expert involved in machinery installation. There are different situations for doing this work: new installations, remove and re-fits (re and re), after repair or during Preventative Maintenance work (PM checks). Each situation will be different. Whether doing a shaft alignment, checking the base for level or flatness, or taking vibration readings, we believe the MAAD method is the most efficient way to do the job the right way. Each step is equally as important as the next. Measurement obviously has to be accurate, using precision instruments. This means it needs to be quantifiable (a known measure), seen by all. It has to be repeatable, verified by other operators, getting the same result. The Analyze section takes place after you have taken your measurement, the “as-found” result. It’s seeing what you have and planning the optimum move for machine units. You may look at previous documentation (the machines history) such as temperature readings for thermal growth considerations, vibration data and so on. You ask the questions, “Can it be done? Do we have the means to do the job? What tool do we use? etc.” Most importantly, it’s where you work on fixing the cause of the issue, not just repairing the effect (fixed forever rather than fixing forever). Once you have a plan, you need to Act and implement that plan – even if it’s to do nothing ie. you were just checking to see if the machine is still aligned. That in itself is an action. Of course, the action or work done here must be done within specification or to standard. Lastly, we have Documentation. This is a record of the complete process – very valuable record – that can help for future potential machine failures or breakdowns. To learn more about how “getting a little MAAD can help you with your Maintenance Processes,” check out this article written by BENCHMARK PDM President, John Lambert. 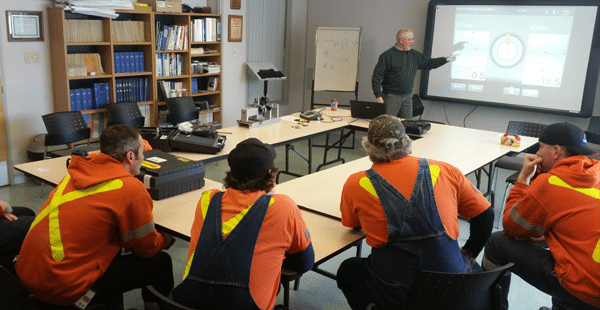 Benchmark brings very strong background knowledge to this field and all trades personnel have expressed their approval their method of theory and hands on learning. I would strongly recommend this training for Trades people and apprentices who are responsible for the installation and maintenance of rotating equipment. 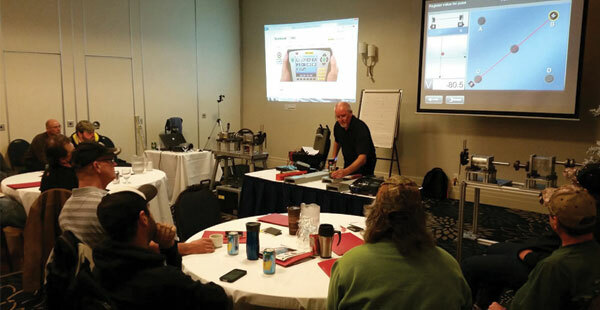 In addition to supplying the equipment, John has also on numerous occasions provided training on rotating equipment to both Training staff and at least 150 Maintenance Trades People. The feedback from this training has been extremely positive.